Demographer believes Israel will be a religious state by 2030. Professor Arnon Sofer, chair of Geo-strategy at the University of Haifa, has published a report predicting a religious majority in Israel by 2030. Professor Sofer sees this as a negative development. His study assumes natural growth of 6-7% in the hareidi-religious sector, which would lead to a hareidi population of more than one million by 2030. The national religious sector, which is involved actively in all spheres of Israeli productivity, is not given separate treatment, leading to a skewing of the predicted outcomes. If not, Sofer said, the second outsome would be the rise of a religious majority that would force the secular minority to learn to live in a religious world. Sofer assumes that the hareidi-religious population would continue to have relatively low employment despite demographic changes and despite statistics that show a rapidly increasing enrollment of hareidi students in work training programs. “As the hareidi population grows, so does the gap between the hareidi population and the rest of the country, and greater sums are necessary in order to close that gap. The difference in participation in the work force not only creates a complete dependency on the working class, but also a growing inequality, dissatisfaction, bitterness... among tax-payers,” he declared. 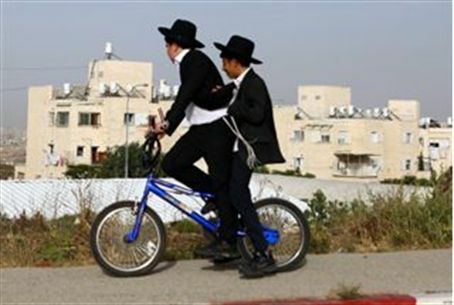 Other changes Sofer predicted in case of a religious majority: a school system that teaches Torah, a justice system based in Jewish law (halakha), and the disappearance of many of today's popular entertainment programs. The changes would lead many secular Israelis to leave the country, he said. He called to prevent the scenarios he predicted by forcing all schools to teach democratic and Western values. “If the decision-makers do not wake up, the Zionist vision will reach a tragic end with the people of Israel's return to exile, to again face anti-Semitism and assimilation,” was his far-reaching conclusion. Professor Sofer has published similarly gloomy predictions in the past, including a famous 1987 claim that by 2000 Israel would no longer be a Jewish state. Israel maintains a strong Jewish majority of 80%, similar to the situation when Sofer's prediction was made.